My Firefly loves getting creative with paper, folding and cutting. So we decided to make a frog on a lily pad for her Daddy's Hoppy Father's Day! 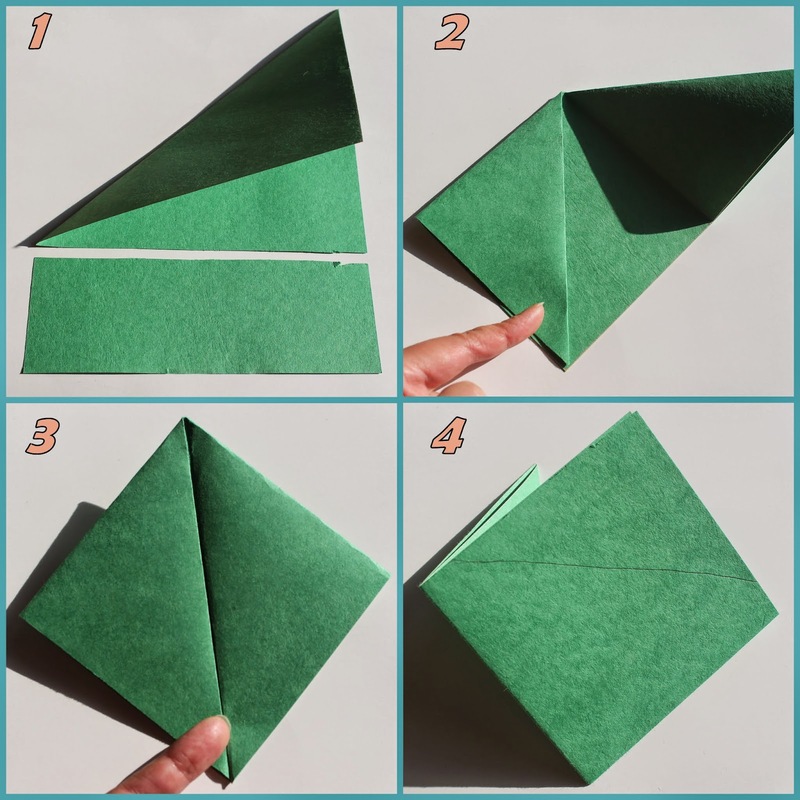 This one is origami that is easy and quick to make. For more Father's Day ideas, visit 10 Fun Ways to Say "I Love You, Daddy!" To make a square out of the standard 9 by 12, fold the paper diagonally edge to edge, and draw a line along the side of the triangle. Cut along the line and discard. The triangle is ready for folding. Bring each of the 2 corners of the triangle to the third corner. Fold as shown on the picture below. Flip the square upside down and position so that the loose corners are on top. Fold the 2 free sides down. Notice that the folding line is drawn slightly above the corners of the square. Draw the lines to round the corners: the bottom of the mouth and around the eyes. Cut along the lines. Draw a folding line above the bottom corner of the frog. Fold the little triangle back - it is a base for holding the frog up. Optional: Staple the little base triangle to a lily pad for more stability. We used a piece of craft foam for the lily pad. A stripe of red construction paper is used for the tongue. Make a cut into the folding line for the upper triangle. The cut is slightly wider then the tongue. Roll the tongue into a tube and thread the free end through the cut. The frog is now able to stick his tongue out. Our Hoppy the frog has caught a heart (sticker). And to complete My Firefly's present, I found this very fun book: "My Dad Is the Best Playground" by Luciana Navarro Powell. I thought this book would be enjoyable for them to read together. Well, I might get lucky and get a cute picture of "Daddy and Me" reading time! Amazon affiliate link: My Dad Is the Best Playground . 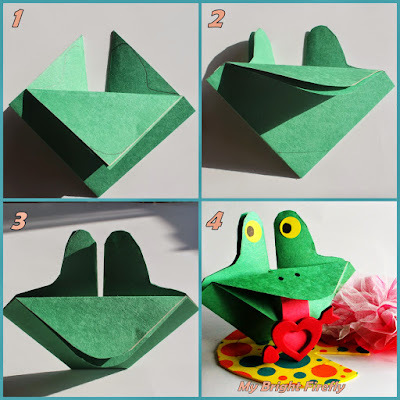 Hoppy Father's Day Frog on a Lily Pad Easy Origami was fun to make and play. I hope our Dad will like it! To make it even more fun for him, we made an origami lily and filled it with M&Ms! It is so easy and quick. All you need is a paper napkin and a cup. We found the tutorial here: Paper Napkin Lily. You can also find our easy origami Lulu the Bookmark here: Parts of a Book with Lulu the Bookmark Preschool Activities.